This split pea and green banana soup , known as arvejas con guineo in Spanish, is a traditional soup from southern Ecuador, and is made with green bananas, peas, onion, garlic, cumin, achiote, cheese and cilantro. This delicious and comforting soup also known lovingly as arvejitas con guineo, and is one of the typical dishes from the province of Loja. It’s a variation of another traditional soup called repe lojano – made with just green bananas. 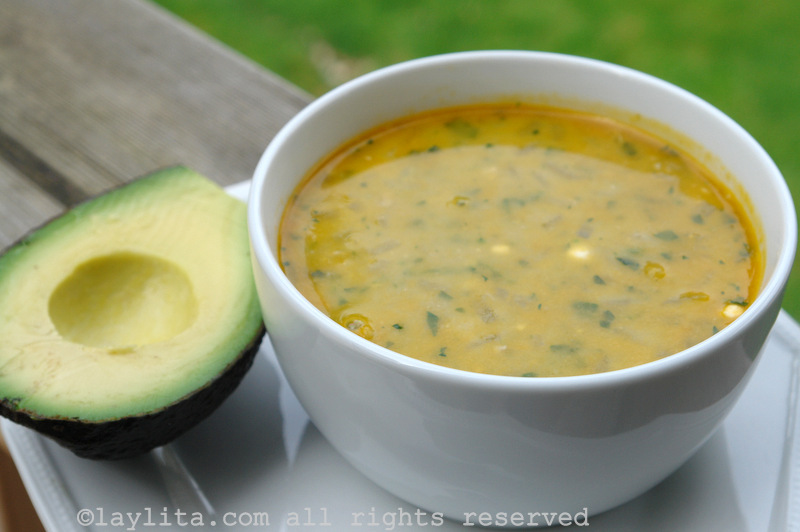 This split pea and green banana soup is served with must have sides of avocado and hot sauce. If you never had this soup before (or green bananas in a soup) it might sound odd, but trust me, this is one of the best soups you will ever taste. 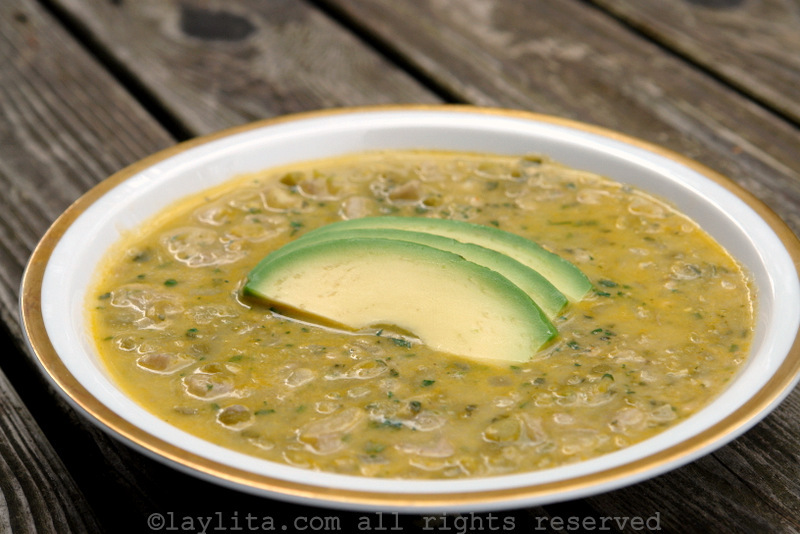 This split pea and green banana soup , known as arvejas con guineo in Spanish, is a traditional soup from southern Ecuador, and is made with green bananas, peas, onion, garlic, cumin, achiote, cheese and cilantro. Cook the peas according to package instructions in water and salt until tender, if desired reserve the broth the peas cooked in to add to the soup (instead of water). Add the water or broth from the peas, bring to a boil and add the diced green bananas, simmer until the green bananas are soft, about 20-25 minutes. Add the cheese and milk, cook for about 5 minutes, stirring occasionally. Add the chopped cilantro, taste and adjust salt to taste. Serve with avocados slices and hot sauce. It is extremely easy to make, probably the most difficult part is finding bananas that are very green. It is especially tricky in the US where sometimes you can find green bananas, but the bananas are actually almost ripe inside. A banana that is truly green should a more difficult to peel than a semi-ripe green banana and should be very starchy and hard. Also, green bananas can stain clothes very easily so watch out for that when peeling/dicing them. You can replace the green bananas with green plantains, which are easier to find, and the flavor will still be good. Purists will say that technically it won’t be exactly the same as the traditional version. However, even for a true “lojano” (which I consider myself to be) you will be able to satisfy your craving and the non-lojanos around you will simply find it to be a delicious and unique soup. In Loja, and Ecuador, we have a cheese called quesillo that is used for this soup. Quesillo is a very fresh cheese, barely a few days old, but it melts perfectly in soups. I recommend using a mozzarella or cheese that melts well and that doesn’t have a strong flavor. Another cheese which is added to soups in Ecuador is called queso de sopa. Queso de sopa is a very crumbly soft and salty cheese, it’s usually made by grinding queso fresco with salt. I use a mix of mozzarella (not fresh) with queso fresco or feta cheese for this soup. My mother makes this soup for me every time I visit her. Growing up, this was an absolute favorite of mine. I would add lime juice and have a avocado (or sometimes even a banana) on the side. My mother is Lojana. Thank you so much for all of your fabulous recipes. I have never been to Ecuador but I’ve been to Peru and loved the food – the cuisines of these two countries are not the same, but there are clearly similarities. My son is marrying a woman from Guayaquil and they often come for the weekend with her parents. I can’t wait to prepare some of these dishes for them. Hola Yessy – Cuando le pongo las hojas de nabo al locro se los agrega durante los ultimos 5 minutos, hay diferentes variedades de nabo en Canada (y EEUU), personalmente me gusta el que le llaman mustard greens – tienen un sabor un poquito picoso, casi como la arugula – y queda muy bien en esta sopa. Tambien le puedes poner chard, queda rico pero estas hojas tienen un sabor semi-amargo en vez del sabor picoso de los mustard greens. I just wanted to say “thank you” for a great recipe! 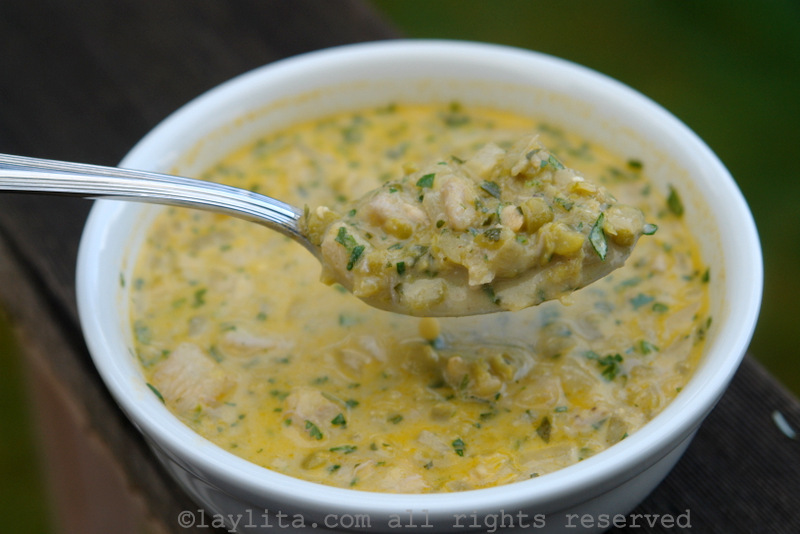 I’m not Ecuadorean but have always wanted to try green banana soup, and your version is terrific. You have a beautiful blog Laylita, thanks for sharing your recipes with us. I have always believed that Ecuadorian cuisine is one of our best kept secrets. Thanks to you, it’s not a secret anymore,. My mother is a Lojana and I love her repe, I can’t make it though. According to her, the secret is not to use metal when you cut the guineo, but my brain doesn’t process the instructions and my repe is always darker than hers, and not as great. I’m going to try your recipe. I bet that you have a good recipe of sopa de bolas de verde. I’m dying to have one. I’m from Ecuador but now live in NY. This soup look delicious, I never had this back home, but then I’m from Guayaquil. Sadly for me my mom did not teach me how to cook any ecuadorian dishes, I learned to cook here after I got married and had children. I’m happy that I found your website. Do you have a recipe for caldo de bola? I’ve found recipes in the web, but did not find them very easy to follow, and the results were just ok. Thanks for sharing with us your recipes. This is my favorite dish/food. “Repe” as my mother calls is the best soup in my country… other than the fanesca and the famous but yet cheap “sopa de fideo”. Ok… all of them are great. That soup is extremely appealing! It looks gorgeous and absolutely delicious! This looks delicious! I am always looking for more plantain recipes, but have never thought of green bananas as a soup base. I love split peas though! I will have to try this when i find some platanos verdes! this sounds and looks really, really satisfying. i always learn something when i come here!